You'll discover tucked-away gems like Castelo dos Mouros and Cabo da Roca. Get some historical perspective at Quinta da Regaleira and Jeronimos Monastery. Get out of town with these interesting Lisbon side-trips: Guincho Beach (in Cascais) and Sintra (Park and National Palace of Pena & Sintra National Palace). Next up on the itinerary: take a stroll through Alfama, take in the exciting artwork at Museu Calouste Gulbenkian, get to know the fascinating history of Belém Tower, and meet the residents at Lisbon Oceanarium. To see where to stay, maps, more things to do, and other tourist information, go to the Lisbon trip maker tool . Teresina, Brazil to Lisbon is an approximately 13.5-hour flight. The time zone difference moving from Brasilia Time (BRT) to Western European Time (WET) is 3 hours. Traveling from Teresina in August, things will get little chillier in Lisbon: highs are around 35°C and lows about 20°C. Wrap up your sightseeing on the 18th (Sun) early enough to drive to Peniche. Peniche is a seaside municipality and a city in Portugal. Let the collections at Battle of Vimeiro Interpretation Centre and Oficina - Museu capture your imagination. Discover out-of-the-way places like Obidos Village and Molhe Leste Beach. Take a break from Peniche with a short trip to Praia da Formosa in Silveira, about 40 minutes away. Next up on the itinerary: explore the historical opulence of Castelo de Óbidos, tour the pleasant surroundings at Praia dos Supertubos (Medão Grande), kick back and relax at Baleal Beach, and explore the gorgeous colors at Miradouro da Cruz dos Remedios. To find reviews, other places to visit, ratings, and other tourist information, use the Peniche attractions planning app . Traveling by car from Lisbon to Peniche takes 1.5 hours. Alternatively, you can take a bus. Traveling from Lisbon in August, you will find days in Peniche are slightly colder (30°C), and nights are about the same (18°C). Finish your sightseeing early on the 21st (Wed) so you can drive to Fatima. Fátima is a civil parish in the municipality of Ourém, in the Portuguese Santarém District. Get outdoors at Serra de Sao Mamede Natural Park and Borboletario Tropical. Your cultural itinerary includes sights like Convent of Christ and Shrine of our Lady of the Rosary of Fatima. 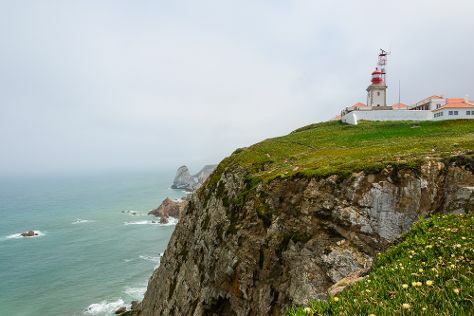 Venture out of the city with trips to Museu Nacional Ferroviario (in Entroncamento), Praia da Nazare (in Nazare) and Monastery of Alcobaca (in Alcobaca). The adventure continues: take in the spiritual surroundings of Batalha Monastery and see the interesting displays at Museu Dos Fosforos. To see maps, ratings, where to stay, and other tourist information, refer to the Fatima road trip planning app . Drive from Peniche to Fatima in 1.5 hours. Alternatively, you can take a bus. August in Fatima sees daily highs of 30°C and lows of 18°C at night. Finish up your sightseeing early on the 24th (Sat) so you can go by car to Porto. Explore hidden gems such as Bom Jesus do Monte and Celanus-Empresa de Turismo, SA. Visit Santuario de Santa Luzia and Cathedral of Santa Maria de Braga for their historical value. Take a break from Porto with a short trip to Centro Historico de Guimaraes in Guimaraes, about 44 minutes away. Dedicate the 26th (Mon) to wine at some of the top wineries in the area. There's still lots to do: contemplate in the serene atmosphere at Porto Cathedral (Se Catedral), see the interesting displays at Casa-Museu Teixeira Lopes, explore the world behind art at Museu Serralves, and take in the architecture and atmosphere at Igreja da Ordem Terceira de São Francisco. To find ratings, reviews, more things to do, and tourist information, read Porto tour planner . You can drive from Fatima to Porto in 2 hours. Other options are to take a bus; or take a train. In August, daytime highs in Porto are 28°C, while nighttime lows are 17°C. Wrap up your sightseeing by early afternoon on the 28th (Wed) to allow enough time to travel back home.